Need a practical and inexpensive, if not especially stylish, people-hauler? Check out the 2012 Hyundai Santa Fe GLS. As the entry-level trim of the lineup, this 4-door 5-passenger compact crossover ute nevertheless sports over 78 cubic feet of cargo room behind the front row, accessible via split-folding rear seatbacks. It also carries 17-inch alloy wheels, a roof rack, cloth upholstery and full power accessories, including heated outside mirrors. Not bad for its paltry base price. But there’s more, including standard cruise control and telescoping tilt-wheel steering, not to mention simulated wood cabin accents and, of course, manually operated air conditioning. Entertainment, meantime, is presented via a 120-watt system boasting an MP3-capable single-CD changer, 6 speakers, a USB port and satellite radio, and all of this is further bolstered by Bluetooth hands-free communications. Options aboard this base trim include remote engine start, carpeted floor mats, a number of added cargo management tools, various exterior upgrades, roof side rails and an auto-dimming rear-view mirror with built-in remote garage door opener. A variable-valve-timed 2.4-liter inline 4-cylinder (I4) engine powers the front-wheel-drive-only 2012 Santa Fe GLS, while its accompanying 6-speed shiftable automatic transmission manages 175 hp and 169 lb-ft of torque. For this year, the 6-speed features standard descent control and allows mileage estimates of 20 mpg city/28 highway. Safety-wise, this base trim sports 4-wheel antilock brakes, traction and stability control, front side-mounted airbags, front and rear head airbags and active front headrests. A remote antitheft alarm also comes standard with this pint-size ute. Take Hyundai’s capable 2012 Santa Fe GLS trim, add standard all-wheel drive (AWD), and behold the GLS AWD compact 5-passenger crossover. Boasting over 78 cubic feet of cargo capacity with the rear seats folded, this base trim is far from basic. Starting with 17-inch alloy wheels and a roof rack, the parade of standard goodies continues with cloth upholstery and full power accessories, including heated outside mirrors. Cruise control and telescoping tilt-wheel steering also come with this traction-heavy ute, as does air conditioning and simulated wood cabin accents. For entertainment, there’s a 120-watt audio system that boasts a single-CD player, 6 speakers and satellite radio, and for the phone fanatic there’s standard Bluetooth hands-free communications. Options in this staid compact crossover include remote engine start, carpeted floor mats, cargo management tools, several exterior upgrades, roof rails and an auto-dimming rear-view mirror with remote garage door opener. Powered by a standard 2.4-liter inline 4-cylinder (I4) engine with variable valve timing (VVT), the 2012 Santa Fe GLS AWD uses its slick 6-speed shiftable automatic transmission to underwrite 175 hp and 169 lb-ft of torque. Boasting standard descent control, the 6-speed automatic meshes with the mechanical center locking and limited-slip differential for power to all four wheels all the time, though mileage drops to 20 mpg city/25 highway. Standard safety features in this cute ute include 4-wheel antilock brakes, traction and stability control, front side-mounted airbags, front and rear head airbags, and active front headrests. Additionally, a standard remote antitheft alarm contributes to owner security. For a little more oomph from the 2012 Hyundai Santa Fe lineup, take a look at the GLS V6. Yep, this compact crossover trim sports a 3.5-liter variable-valve-timed (VVT) V6 engine and standard 6-speed shiftable automatic transmission (now featuring descent control) that combine to throw down 276 hp and 248 lb-ft of torque. That’s good enough to tow up to 3,500 pounds of trailer with the available tow package, and mileage isn’t that bad, at 20 mpg city/26 highway from the front-wheel drivetrain. Not only is this capable crossover potent, it’s also roomy and comfortable, while available cargo space is a respectable 78.4 cubic feet with the rear seats folded. Boasting seating for 5, Hyundai’s pint-size people-hauler also flaunts 17-inch alloy wheels and a roof rack, as well as cloth upholstery and full power accessories, including heated outside mirrors. Cruise control and telescoping tilt-wheel steering are also standard, as are air conditioning and simulated wood cabin accents. 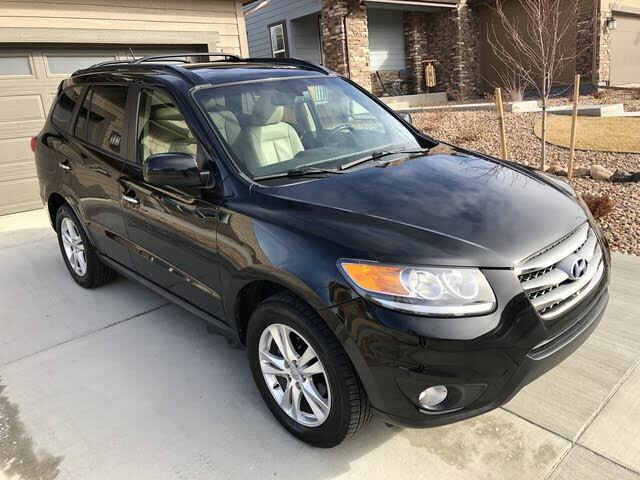 Remote engine start is available for the 2012 Santa Fe GLS V6, as are carpeted floor mats, roof rails, some additional cargo management items, a few appearance upgrades and an auto-dimming rear-view mirror with remote garage door opener. Of course, safety hasn’t been neglected in Hyundai’s popular crossover, with 4-wheel antilock braking (ABS), as well as traction and stability control all delivered as standard equipment. Inside, look for front and rear head airbags, front side-mounted airbags and active front headrests, while a remote antitheft alarm helps provide vehicle security. Stocked with a standard 3.5-liter V6 powerplant and loaded with creature comforts and techno-goodies, the 2012 Hyundai Santa Fe SE is a distinct step up from its more prosaic GLS siblings. Of course, the ubiquitous 78.4 cubic feet of cargo space (with the rear seats folded), as well as the cloth/leather upholstery and power-adjustable driver’s seat further enhance this 5-passenger compact crossover’s image in the mind of the frugal, family-rearing commuter. Add to all that 18-inch alloy wheels, a roof rack and rear spoiler, not to mention standard trailer wiring and an available tow hitch, and this midlevel trim looks better and better. Of course full power accessories, including heated outside mirrors, grace this classy mini-ute, as do a leather-trimmed steering wheel and shift knob, simulated wood cabin accents, cruise control and telescoping tilt-wheel steering. Finally, standard entertainment stuff includes a 120-watt stereo with an MP3-capable single-CD player, 6 speakers, satellite radio and a USB connection, all bolstered by Bluetooth hands-free communications. Options, meantime, include remote engine start, carpeted floor mats, several cargo management features, a few appearance upgrades and an auto-dimming rear-view mirror with remote garage door opener. Then there’s the available Premium Package, boasting a power sunroof, a navigation suite with dashboard-mounted display, a rear-view camera and a 350-watt audio upgrade boasting 7 speakers. Power-wise, the Santa Fe SE’s variable-valve-timed (VVT) V6 mates with a standard 6-speed shiftable automatic transmission (boasting standard descent control) to put out 276 hp and 248 lb-ft of torque to the tune of 20 mpg city/26 highway. Furthermore, when properly equipped, this midlevel V6-endowed crossover can tow up to 3,500 pounds of trailer. Standard safety equipment for Hyundai’s 2012 Santa Fe SE includes 4-wheel antilock brakes (ABS), traction and stability control, front and rear head airbags, front side-mounted airbags and active front headrests. Finally, topping it all off are a standard remote antitheft alarm and front fog/driving lights. Though presented as the base trim level of the 2012 Hyundai Santa Fe lineup, the GLS V6 AWD is anything but basic. This 5-passenger compact crossover ute, as its name implies, comes stocked with a 276-hp variable-valve-timed (VVT) 3.5-liter V6 engine that combines with a 6-speed shiftable automatic transmission, now with standard descent control, for 248 lb-ft of torque. Then there’s full-time all-wheel drive (AWD) that’s managed by a mechanical locking limited-slip center differential for constant torque to all four wheels. This potent powertrain, meantime, can tow up to 3,500 pounds with the available towing equipment, while mileage is estimated at 20 mpg city/26 highway. This randy little ute additionally sports 78.4 cubic feet of cargo area with the rear seats folded, not to mention 17-inch alloy wheels, a roof rack, cloth upholstery and full power accessories, including heated outside mirrors. Such standard conveniences as cruise control and telescoping tilt-wheel steering also come standard on this peppy people-hauler, as do air conditioning and simulated wood cabin accents. Finally, techno goodies delivered with the GLS V6 AWD include a 120-watt audio system with an MP3-capable single-CD player, 6 speakers, satellite radio and a USB port. Communications are handled, meantime, by Bluetooth hands-free technology. Remote engine start is but one option for Hyundai’s capable compact crossover. Carpeted floor mats, several cargo management tools, a few exterior upgrades, roof rails and an auto-dimming rear-view mirror that includes a remote garage door opener are all additionally available. Finally, standard safety equipment aboard the 2012 Santa Fe GLS V6 AWD includes 4-wheel antilock brakes, as well as the traditional traction and stability control. Inside, expect front and rear head airbags, front side-mounted airbags and active front headrests, with a remote antitheft alarm thrown in for good measure. Implicit in the top-shelf 2012 Hyundai Santa Fe Limited is a certain cachet of posh. And with the plethora of standard creature comforts and appearance bling, this 5-passenger compact crossover doesn’t disappoint. Over 78 cubic feet of cargo space (with the rear seats folded) hold all that vacation gear, while the standard 18-inch alloy wheels, rear spoiler, power sunroof and roof rack keep this plush people-hauler looking presentable on the road. Leather upholstery, heated front seats and a power-adjustable driver’s seat all come standard in the cabin, as do full power accessories, including heated outside mirrors, along with cruise control and telescoping tilt-wheel steering. A universal remote garage door opener is also included, as are simulated wood cabin accents, a leather-wrapped steering wheel and shifter knob, dual-zone climate control and auto-dimming rear-view mirror. The most distinctive feature to grace this plush people-hauler is the standard 605-watt audio system that supports an MP3-capable 6-CD changer, 10 speakers, 7.1 Surround Sound, satellite radio and a USB port. Standard Bluetooth technology, meantime, sees to hands-free communications. Options for this flagship trim include a Navigation Package with DVD navigation, a 6.5-inch dashboard display (replacing the 6-CD changer with a 4-CD one) and a rear-view camera. Remote engine start is one of the more notable standalone options, as are carpeted floor mats, various cargo management items and some added exterior endowments. Powering the 2012 Santa Fe Limited is a variable-valve-timed (VVT) 175-hp inline 4-cylinder engine (I4) that mates with the standard 6-speed shiftable automatic transmission for 169 lb-ft of torque. The four-banger is estimated to get 20 mpg city/28 highway, while the 6-speed automatic boasts standard descent control. Four-wheel antilock brakes are among the standard safety features aboard Hyundai’s high-end Limited, along with traction and stability control, front and rear head airbags, front side-mounted airbags and active front headrests. This posh crossover also boasts a remote antitheft alarm and front fog/driving lights. Add standard all-wheel drive (AWD) to the midlevel 2012 Hyundai Santa Fe SE to behold the capable and well-equipped Santa Fe SE AWD compact crossover. This 5-passenger mini-ute boasts over 78 cubic feet of cargo space, accessible by folding the split rear seatbacks, as well as a standard roof rack, 18-inch alloy wheels, trailer wiring, a rear spoiler, power-adjustable driver’s seat and leather/cloth upholstery. Full power accessories, including heated outside mirrors, are also standard, as are cruise control, telescoping tilt-wheel steering, a leather-wrapped steering wheel and shifter knob, air conditioning and simulated wood cabin accents. A 120-watt audio system with MP3-capable single-CD player and 6 speakers provides the tunes, complemented by satellite radio, a USB port and Bluetooth hands-free communications. Options for this pint-size ute, meantime, include remote engine start, carpeted floor mats, cargo-management equipment, upgraded appearance bling, roof rails and a tow hitch. As well, the SE AWD is eligible for the available Premium Package, boasting a power sunroof, navigation (with 6.5-inch dash display), a rear-view camera and an upgraded 350-watt audio system with 7 speakers. Powering the 2012 Santa Fe SE AWD is a variable-valve-timed (VVT) 3.5-liter V6 engine that pounds out 276 hp and, helped by the standard 6-speed shiftable automatic transmission, 248 lb-ft of torque. Equip the SE AWD with the available tow hitch and she’ll pull up to 3,500 pounds of trailer, with mileage estimated at 20 mpg city/26 highway. Descent control, by the way, is standard with the 6-speed automatic, while the full-time AWD system sports a locking and limited-slip mechanical center differential. Safety is certainly not neglected in this capable crossover, with 4-wheel antilock brakes standard, along with traction and stability control. Front and rear head-curtain airbags also come standard, as do front side-mounted airbags and active front headrests, while secondary safety and security features include front fog/driving lights and a remote antitheft alarm. Need a few more ponies in that flagship 2012 Hyundai Santa Fe? Check out the 2012 Santa Fe Limited V6. This 5-passenger compact crossover boasts a standard 3.6-liter V6 powerplant that mates with the ubiquitous 6-speed shiftable automatic transmission for 276 hp and 248 lb-ft of torque. With the available tow hitch and wiring, the front-wheel-drive (FWD) Limited V6 can haul up to 3,500 pounds of trailer, while variable valve timing (VVT) keeps mileage at a respectable 20 mpg city/26 highway. As the high-end trim of Hyundai’s Santa Fe lineup, the Limited V6 boasts 18-inch alloy wheels, a rear spoiler and roof rack, a power sunroof and heated power-adjustable mirrors outside, with leather upholstery, simulated wood accents and a leather-wrapped steering wheel and shifter knob adorning the inside. Additionally, this capable-yet-posh crossover sports a power-adjustable driver’s seat, remote power door locks and power windows, not to mention cruise control and telescoping tilt-wheel steering. The standard universal remote garage door opener is a nice touch, as is the dual-zone automatic climate control. Further techno-goodies include a 605-watt audio system with MP3-capable 6-CD changer, 10 speakers 7.1 Surround Sound, satellite radio and a USB port, not to mention standard Bluetooth hands-free communications. On a more pragmatic note, over 78 cubic feet of cargo space is available to Limited owners when the rear seats are folded. Anyhow, options for this top-shelf trim run from remote engine start to carpeted floor mats, some added exterior trim to various cargo management tools. And then, there’s the available navigation suite featuring hard-drive-based navigation, a 6.5-inch display and a rear-view camera. Standard safety features aboard the 2012 Santa Fe Limited V6 include 4-wheel antilock brakes (ABS), traction and stability control, front and rear head airbags and active front headrests. Front fog/driving lights, meanwhile, and a remote antitheft alarm top off the list of notable safety equipment. For those who must deal with the occasional wintry drive yet desire a comfortable haven after shoveling out the driveway, Hyundai offers its 2012 Santa Fe Limited AWD. As the moniker implies, this 5-passenger compact crossover features full-time all-wheel drive (AWD) managed by a mechanical limited-slip locking center differential. It also sports a peppy 3.5-liter V6 powerplant and 6-speed shiftable automatic transmission, with standard descent control, that combine for 276 hp and 248 lb-ft of torque, good enough to tow 3,500 pounds of trailer when the available tow hitch and wiring are added. Estimated mileage, meanwhile, is 20 mpg city/26 highway. Of course, standard appearance features abound, with 18-inch alloy wheels carrying a rear spoiler, roof rack, power sunroof and over 78 cubic feet of cargo space (with the rear seats folded). Inside, look for leather upholstery, heated front seats, with power-adjustable driver’s seat, dual-zone climate control and simulated wood cabin accents, as well as a leather-wrapped steering wheel and shifter knob. Cruise control and telescoping tilt-wheel steering also come standard aboard this flagship trim, as do full power accessories and a universal remote garage door opener. Finally, Bluetooth hands-free communications are complemented by a 605-watt stereo system with 6-CD changer, 10 speakers, 7.1 Surround Sound, satellite radio and a USB connection. The 2012 Santa Fe Limited is eligible for a Navigation Package that flaunts a 6.5-inch dashboard-mounted display and rear-view camera, as well as, obviously, a DVD navigation system. Then there’s remote engine start, various cargo management tools, some added exterior bling and carpeted floor mats, all available as standalone options. Standard safety equipment, meantime, includes 4-wheel antilock brakes (ABS), traction and stability control, front and rear head airbags, front side-mounted airbags and active front headrests. Additionally, this top-shelf crossover trim sports a remote antitheft alarm and front fog/driving lights.